This is Grim Dawn expansion pack. Grim Dawn: Forgotten Gods is a second big expansion for 2016’s action-RPG title Grim Dawn. This is a standalone expansion, meaning that the core game is not required, and both have been developed by Crate Entertainment studio. The add-on offers a new single player campaign, which lets us go outside boundaries of Erulan Empire, which we explored in the base game and the first expansion. We venture to a completely new area, filled by deserts burnt by sun, oasis and volcanic terrain. There, in the heart of these lands, lies a forgotten city, with secrets that should never see the light of the day. The plot revolves around an awakening of the titular forgotten gods – ancient beings who struck fear even in the hearts of the previously seen Witch Gods. 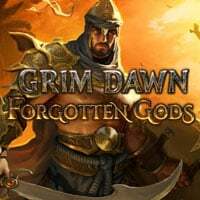 Grim Dawn: Forgotten Gods does not change the base game’s mechanics, as it focuses on delivering more content instead. It still offers a hack’n’slash gameplay, in which we mainly explore the world, develop our hero and eliminate hordes using arcade battle system. The expansion enriches Grim Dawn with many new powers and hundreds of previously unseen items. We can also face tens of new enemies, both at the surface and in countless underground locations. Lastly, we can enjoy an additional game mode. As is the case with the gameplay, Forgotten Gods offers similar visuals as the base version of Grim Dawn. However, the change of environment resulted in a very different atmosphere and style compared to what we could see in our previous adventures. Game score 9.2 / 10 calculated out of 29 players' votes. Expectations before the premiere: 9.0 / 10 calculated out of 43 players' votes.